Background: Flavones, are a class of naturally occuring polyphenolic compounds which have 2-phenylchromen-4-one structure. Various studies showed that flavones have several pharmacological activities such as antioxidant, anti-inflammatory, antimicrobial, cytotoxic, antitumour and antiallergic. 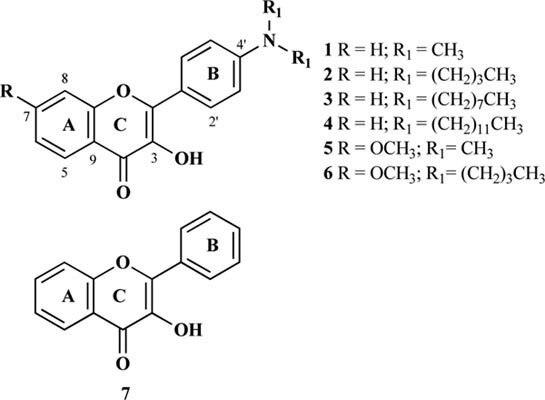 In the present study, 3-hydroxyflavones also called flavonols, posessing 4'-dialkylamino moiety were synthesized, and their antioxidant and anticholinesterase activities were investigated by comparison with unmodified 3-hydroxflavone. Method: For investigation of antioxidant potential, radical scavenging assays (DPPH•, ABTS+_, O2 .-) were used along with CUPRAC and lipid peroxidation inhibitory assays, as well as anticholinesterase activity by Ellman method. Results: The best results were obtained for 4'-N,N-dimethyl flavonol (1) in both antioxidant and anticholinesterase activity tests, possibly due to its least steric hinderance effect. It exhibited remarkable DPPH free radical scavenging activity (2.43±0,09 μg/mL) competing with a standard compound quercetin (2.10±0,10 μg/mL). Moreover, the other tested flavonols also showed high antioxidant activities. Compounds 5 and 6 exhibited close IC50 values to those of compound 1. Conclusion: Antioxidant activity test results were found to be well correlated with anticholinesterase activity test results indicating possible role of antioxidant compounds in the treatment of Alzheimer’s disease. Alzheimer's disease, anticholinesterase, antioxidant, flavonoid, flavonol, 3-hydroxyflavone.